As part of the Mechanical Engineering decant, the low speed wind tunnel will be removed from the wing during the week commencing 3 August 2015. The area occupied by the wind tunnels and the central corridor will become a construction zone during this time as sections of the tunnel are moved across the corridor and into the main workshop. During this week, there will be no access for staff or students to the wind tunnel area, and the corridor will be blocked. Signage indicating an alternative pedestrian route will be in place. If you use Engineering Road, you’ll have noticed a lot of activity behind the hoardings opposite Facilities Management as the new Structural Engineering Laboratory begins to take shape. Capable of testing full-scale building systems under a variety of load conditions, this facility will put UC at the forefront of earthquake engineering education and research in New Zealand. Due for completion in February 2016, the laboratory will comprise a 2 metre thick strong floor of 300 square metres total area, and 1.6 metre thick walls that run 9.2 metres high and 28 metres long. This ongoing programme is delivering some of the most modern teaching, learning and research facilities in the southern hemisphere. At the heart of campus, the exciting new Regional Science and Innovation Centre (RSIC) is being constructed, while to the north, every wing of the Engineering precinct is being either rebuilt or refurbished in the Canterbury Engineering the Future (CETF) development. 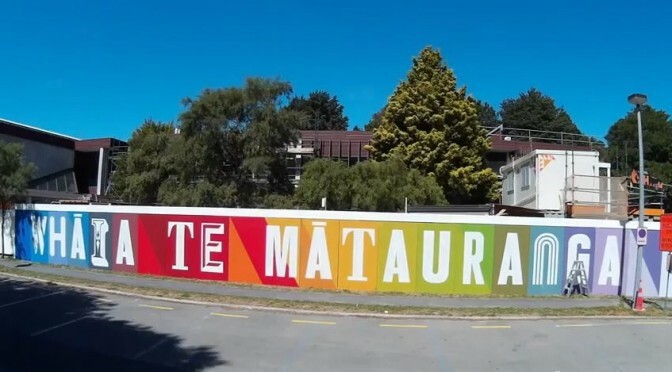 There are also projects underway in central Christchurch reconnecting the University to its historic roots and enabling it to play a vital role in the future of the new city with strong community links through the arts and health sectors. You can keep up with all the ongoing projects at any time here. If you’ve wondered about the rainbows on the hoardings around campus, the spectrum has been taken from the College colours. The words depict College names and themes; think for Arts, analyse for Law; solve for Engineering; broaden for Business; inspire for Education and discover for Science. The phrase Whāia te mātauranga along Forestry Road translates to ‘pursue knowledge’ and we time lapsed this as it was being applied. See how it shaped up here .